Happy Tuesday everyone, I hope you are doing fine. Today, I decided to talk about disclosure policy. Last year, when I started blogging, I had no idea what disclosure policy was, as well as I had no idea about blog monetizing and affiliate marketing. But when I first accepted to publish a sponsored post on my blog, I realized, it was time to learn about disclosure policy that every blogger has to have on their blogs. That was the time, I found out that the Federal Trade Commission requires bloggers to disclose whether they have received any type of payment (or free products) in exchange for a review or any other kind of post. You, basically, have to create a separate page, (or just keep it on your blog's sidebar,) where you will disclose in general, whether your blog accepts sponsored posts, uses affiliate links or paid reviews (or reviews in exchange for some freebies) and you have to let your blog readers know, how you will disclose every time you write a sponsored post or use affiliate links in your post. 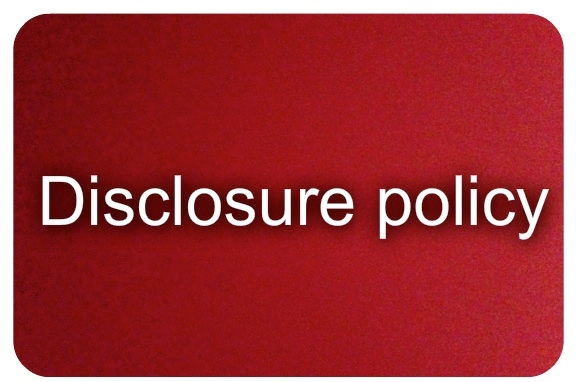 Once you have your disclosure policy on your blog, you have to follow it. The most common practice is to say that 'This is a sponsored post' or 'I got this product free for review purpose' (if you write a review,) or 'This post contains affiliate links', at the top or bottom of the post. The bottom line here is that you have to say it clearly, using just * is not enough. Did you know that disclosure policy applies not only your blog, but your social media too? I personally didn't know until I didn't read one of my favorite books about social media marketing. If you write a product review and you are pinning it to your social media , you have to disclose it. The same way, if you are pinning or tweeting some affiliate links, you have to disclose your intentions. You can simply type 'Affiliate link' or 'Sponsored review' in you description on your social media. This way, you will satisfy the Federal Trade Commission guidelines and at the same time, you will show your readers and followers that you are honest with them. I hope, this post will be helpful for you guys. Do you use disclosing policy on your blog and social media? Let me know in the comments below and have an amazing day. This post was very helpful! Great tips! Great post! I actually didn't know a lot about this! Thank you for highlighting this matter, Nina. I'm still surprise how many bloggers are not aware of this and continue to be vague about sponsored posts or PR products. I try to be as open as possible about products sent to me, because I majorly dislike it if I have to read the minimalistic hidden sentence at the bottom of the site to know what kind of post this is. Waw such a cool post! I have to say that I am totally impressed! Thanks for this, I didn´t know it! :) What if we follow each other? Let me know, sweetie! Thx for sharing this helpful information, Great post, dear. I have heard so many different things about this topic that it can get kind of confusing what you are actually supposed to do. This post really make the whole thing seem simpler. Thanks! This is so helpful! I haven't needed to use this yet but now I know what to do! Thanks for stopping by my blog! Love yours! Wow, this is really helpful! Thanks for sharing! Great tips! Especially for beginning bloggers. I have mentioned it on my blog pretty much straight away, but at first I had no idea. Thank you for letting me know about this! I can't believe there's so many rules and regulations about these kinda things! Hopefully I'm doing it right! Thanks for sharing! This is such a great and informative post! Thanks for sharing this with us, I'll definitely be referring to this to make sure everything is in order with my blog. Great post! Very important info/1 Thanks for sharing! I knew about disclosure policy but i never needed before on my blog ! These days i have to do one sponsored post but i plan to writee it in the bottom of my post with a * !